When you’re creating stickers, choosing the right material is as important as getting the size, shape and design right. But a lot of people don’t really understand the differences in materials for stickers. To experiment with different materials, you can try samples of all Avery WePrint for just stickers from £10 to £13. The amount of samples depends on the sticker size and material, ranging from 80 small paper stickers, to four large stickers in the sample packs. 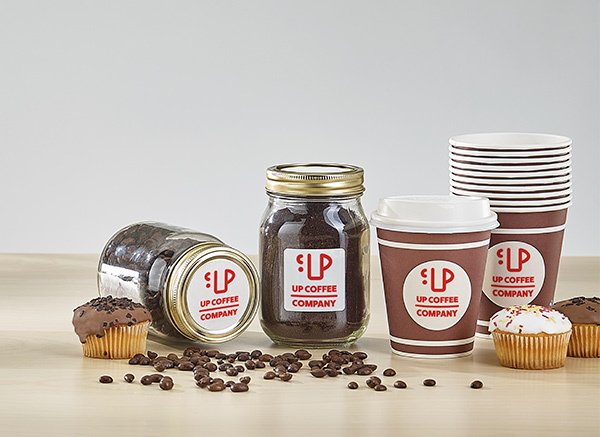 Greater appeal – high quality sticker materials combined with our digital photo printing technology enhance your sticker designs and bring them to life to give a great impression of your products, gifts and other items. 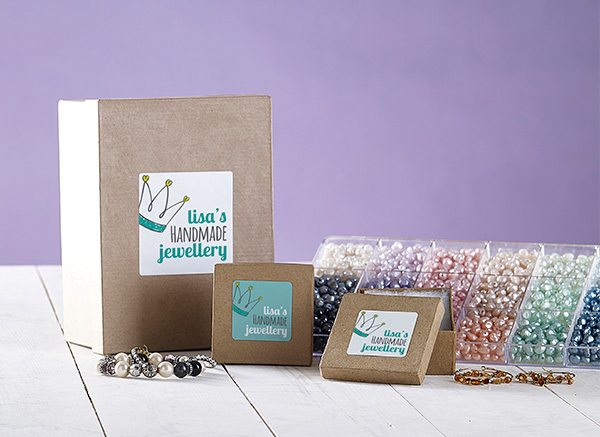 More choice – a choice of materials is essential so you can find the one that best suits your products, packaging, brand and designs. Longer lasting – the sticker material, combined with our printing processes and adhesive, work together to help prevent fading, slipping and damage. Most people think of paper when they think of stickers – and with good reason. Paper is versatile, great value and easy to apply. 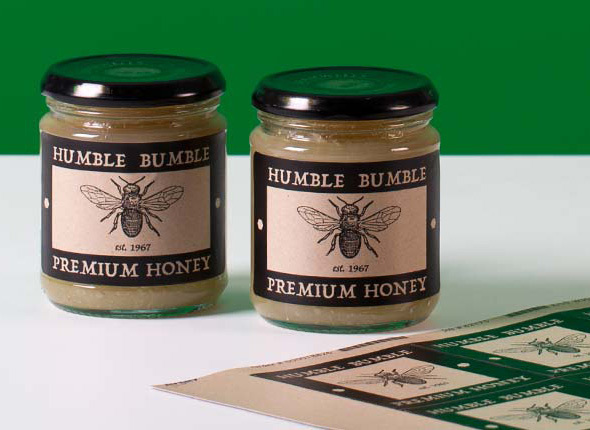 Paper Stickers can fulfill a wide range of packaging needs, and they can be useful in the office. Avery WePrint Paper Stickers are even suitable for food, as it’s safe to place these stickers directly onto dry and moist non-fatty foods. Paper offers the widest range of sticker sizes and there are three finishes: matt, gloss and natural. Start creating your Paper Stickers here. If you want to achieve a really professional, sleek look, Plastic Stickers are ideal. They work well on all kinds of packaging, including glass or plastic bottles and jars or plastic bags. Being water resistant, Avery WePrint Plastic Stickers are very popular for beauty products, such as shampoo. Another important advantage is that Plastic Stickers are pliable, so they can conform to surfaces that are not flat; but rounded or flexible. We’ve made the Plastic Stickers easier to apply by making the adhesive less tacky when you first make contact with the object, giving you the chance to re-position. We also varnish them to protect the print quality and you can choose between gloss or matt finishes. Start creating your Plastic Stickers here. Would you like to go for a rustic, natural or homemade look for your produce, or beauty products? 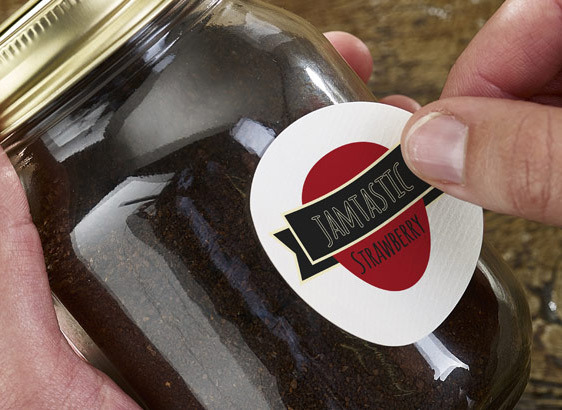 Brown Kraft Stickers will help you achieve that handcrafted, organic look. And you can add a unique personal touch by writing on the matt finish of Brown Kraft Stickers. If you have an eco-friendly ethos, it’s good to know that these Kraft paper stickers are made from 100% recycled paper. Brown Kraft Paper Stickers are finished with a protective varnish. We’ve designed them to stick well to most surfaces with permanent adhesive, so you can use them on glass or plastic containers and bottles, and all types of packaging, including paper bags and boxes. Start creating your Brown Kraft Labels here. 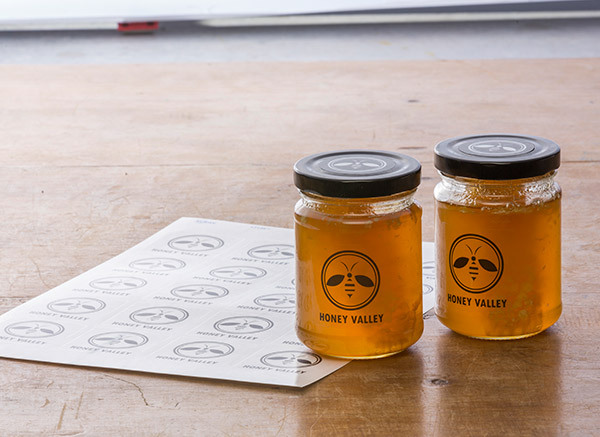 If you’re looking for drinks bottle stickers or jar stickers for produce with a more upmarket, vintage or slightly rustic feel, take a look at Textured Paper Stickers. Made from thicker, premium paper material, these stickers have an almost ‘woven’ feel and come in an off-white colour. 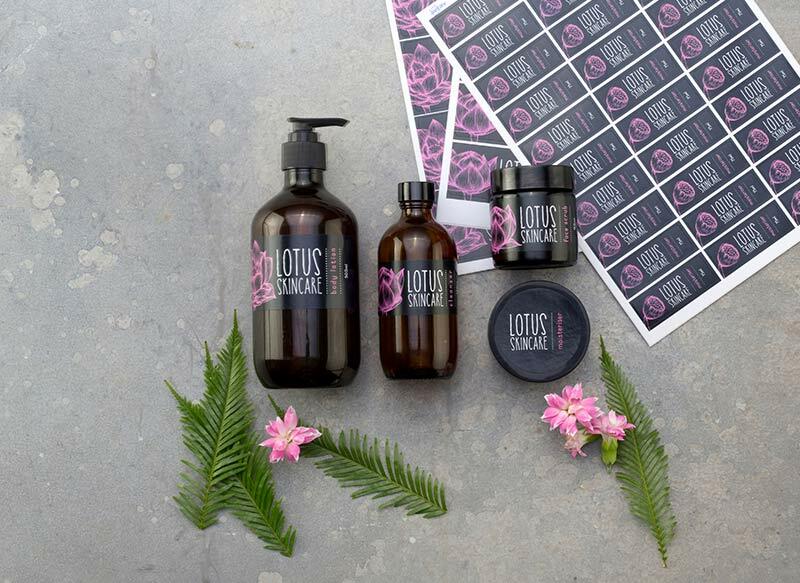 But Textured Paper Stickers are not just about the look – these stickers also have practical advantages that make them perfect for drinks bottles and food jars. We’ve give given Textured Paper Stickers extra splash-proof properties and made them suitable for damp or extreme conditions. In addition to being mould-proof, these stickers have high wet strength to make them last longer, so they can withstand being in ice buckets or damp cellars. Textured Paper Stickers can also withstand refrigeration and hot washes with temperatures going from -20°C to 80°C. The finish on Textured Paper Stickers is matt. Start creating your Textured Paper Labels here. Great for drinks and produce, clear stickers are durable, water resistant and long lasting. Clear Stickers can make it appear as though you’ve actually had your bottles or containers printed! We’ve developed a way of printing Clear Stickers with white underprint to make your designs stand out more. You can choose to have a matt or gloss finish. Designed to be durable and water resistant, Clear Stickers also work well on bottles and rounded shapes because they’re flexible and easy to apply. They’re also suitable for indirect contact with food. Start creating your Clear Labels here. If you need highly durable stickers for tough conditions, Avery WePrint Waterproof Stickers have been made to meet international industrial standards. These stickers can withstand extreme temperatures, soaking in water and exposure to oil and chemicals. Certified to adhere under sea water for at least 90 days, Waterproof Stickers meet BS5609 – the standard for identification and warning labels on chemical drums transported by sea! Avery WePrint Waterproof Stickers are, however, safe for indirect contact with food, so you can use them on bottles that are likely to be soaked extensively in ice, for example, or containers that will be frozen for long periods. The temperature range for these stickers is -40°C to 150°C. You can also write on the thick, Polyethylene film material of Waterproof Stickers, which is smudge-proof and has a satin finish. Start creating your Waterproof Labels here. To see all the sticker materials with the shapes, sizes and prices in one go, see our handy table.